"Starting today, we are testing tools to help people manage how they interact with their former partners on Facebook after a relationship has ended. When people change their relationship status to indicate they are no longer in a relationship, they will be prompted to try these tools." See less of a former partner’s name and profile picture around Facebook without having to unfriend or block them. Their posts won’t show up in News Feed and their name won’t be suggested when people write a new message or tag friends in photos. 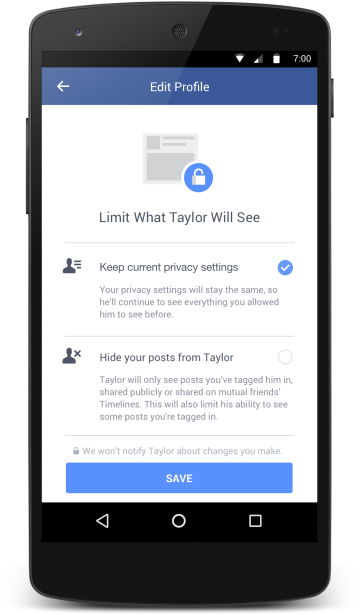 Limit the photos, videos or status updates that a former partner will see. Edit who can see their past posts with a former partner and untag themselves from posts with that person. The new tools debuted last Thursday, Nov. 19th, just in time to rid all your exes from your holiday timeline. All of these tools are optional, and you will be able to access them in the help center anytime.